Baffad (pronounced buff-aad) is a versatile coconut curry that can feature either chicken or prawns. It is made by grinding chillies and a variety of spices with a splash of vinegar. The pungent aroma while grinding the spices takes some getting used to but even a tiny batch like this one can last for 2-3 uses. We always knew visitors were expected when we smelt this masala (spice paste) being made. It was mum’s go to dish – the rich flavourful curry was always a hit with baffad novices and veterans alike. I have tamed it down to suit a 6 year old’s palate. Feel free to turn up the chilli-meter to a level you like. Grind all the ingredients for the spice mix with a splash of water. This should take about 5 minutes, in intervals of 1-2 minutes. You are looking for a smooth and velvety paste. Marinate the chicken with salt, 1/2 tsp turmeric powder and 1 heaped tablespoon of the spice mix. (You can also use chicken on the bone.) Keep aside for 20 minutes or longer. Add chopped onions & fry well till light pink. Then add marinated chicken and saute for a few minutes. Add some water and cook till chickenis almost cooked. Add the coconut milk and bring to a gentle boil. Turn down the heat and simmer for 2-3 minutes stirring constantly so that the coconut milk does not separate. Turn off the heat and let it rest for about 20-30 minutes. Serve hot with steamed rice and some fried prawns on the side. I used white wine vinegar and that works just fine. The standard version used is the dark malt vinegar. Freeze the extra masala for the next time you would like to make this. It stays well for about 304 months in the freezer. You can adjust the quantity of the spice mix, depending on how many chillies you have used and how spicy you like your curry. Remember that the coconut milk will temper it down anyway. 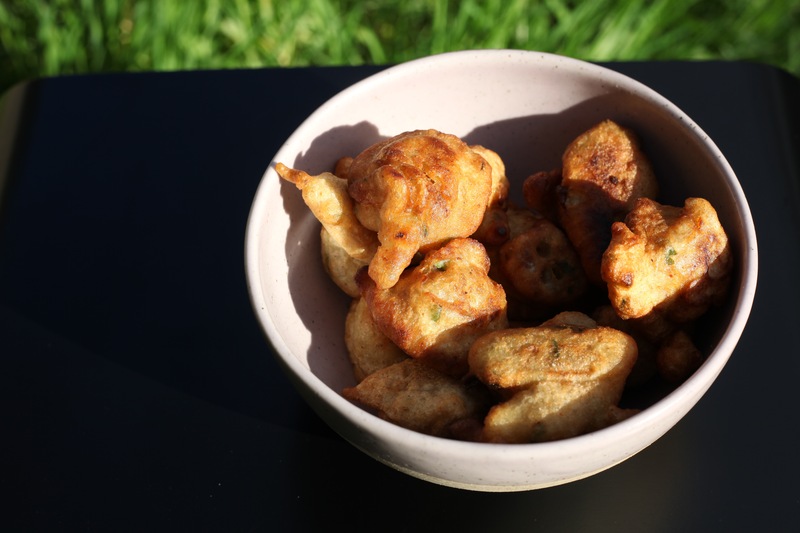 This is certainly a strange choice of a ‘recipe’ but if you’re looking for a snack that brings the family together and away from their devices, this one is hard to beat. All the cooking it involves is boiling peanuts in their shells, in salted water. We used to gather around our dining table, on a Sunday afternoon, over a large pot of these ‘shenga’ (pods) and talk about everything under the sun. You knew that everyone was enjoying them when the table went silent and all you could hear was the cracking of the pods, muted munching and see happy, dreamy smiles and the pile of ‘shenga’ rapidly dimishing. Move over, fancy salted edamame! We have had boiled peanuts long before you appeared on restaurant menus. Heat the pot of water. Add the salt before it starts boiling. Throw in the peanut pods. Make sure the pods are all submerged in the water. Enjoy the peace and quiet at the table and watch this become a favourite family ritual. Do you have foods that bring your family together? Thaalipeeth is a popular Maharashtrian griddlecake or flatbread – made from a variety of grains, or a combination of a few. Veggies are not a common ingredient, though my mum does add roasted and mashed aubergine, on occasion. This red pumpkin and peas combination is more unusual. I discovered it quite by accident and decided to experiment with it. The original recipe had a list of ingredients with hints and tips, but the rest was left to the chef’s intuition. So I made up the measurements on the fly. My association with thaalipeeth is with winters, when the wind is blustery and your body needs some warming foods. Even when mother nature is playing truant and raining down unseasonally (and we’ve certainly witnessed our share in the last few weeks) – these make an ideal weekend brunch option. Microwave the grated pumpkin for 2-3 minutes, until it is cooked enough to be mashed with a fork. Microwave the peas until cooked. In a large mixing bowl, add the whole wheat flour, rice flour, sesame seeds, ghee, salt, chillies, coriander, paprika, cumin powder and black pepper. Mix well together with your fingers. Once the pumpkin and peas have cooled slightly, add these to the mixture. Knead well with your hands. The pumpkin and peas are quite moist and the mixture does not need any additional water for the kneading. Knead until the dough has come together and is slightly stretchy. Divide into equal number of balls. This recipe should make 10-12 balls. Heat a shallow frying pan. Add a teaspoon of ghee and swirl it around. You should have enough to roast these thaalipeeth. Place it onto the frying pan. Swirl the ghee around or add a few drops to the centre and sides of the thaalipeeth. Cook till golden and then flip over and cook the other side. They are great on their own but you can also serve them with a cooling yoghurt-cucumber raita. Roath rhymes with coat, announced our 4 year old as he munched on a piece over the weekend. If you are not familiar with this semolina cake, now may be a good time to give it a try. It is the perfect counterfoil to spicy or oily snacks as it gently balances the tastes in your mouth so you can enjoy every bite. Roath is made from semolina soaked in milk, sweetened, and then gently spiced with cardamom, nutmeg and a dash of saffron. My earliest memory of roath is eating it in my great grandmother’s house when we visited her. Mothi Aji, as she was called, enjoyed churning out a great variety of delicacies for us to snack on . (It does run in the family! ).We used to enjoy great chunks of this cake, served with a spicy helping of her famous tikhat rawa or pangojis. She lived alone, shopped and cooked for herself, eschewing all offers of help until she was well into her nineties. Her zest for life has certainly been passed down to my Aji who is cut from the same cloth. Pathare Prabhu cuisine has been influenced by Western techniques like baking and has adpated a number of dishes that owe their origins (and their yumminess) to the confluence of these styles. Roath is one such example and I do hope you enjoy it. In a bowl, add the semolina and 2 tablespoons ghee. Rub the ghee into the semolina with your fingertips. Now try and squish this semolina mix into a ball. If it retains the shape, the ghee is sufficient. If it crumbles away, add an additional tablespoon of ghee and rub it in. Add the warm milk into the semolina till the mixture is thinned down but not runny. Keep this aside for an hour so that the semolina can absorb the milk. After an hour, add the sugar and mix well. Now add the soaked raisins, spices, saffron. Mix well. Pour into a greased baking dish and bake at 180 C for about 25 minutes or till the top is golden. Serve with some spicy snacks and a steaming cup of coffee. I think it makes a great breakfast cake too!